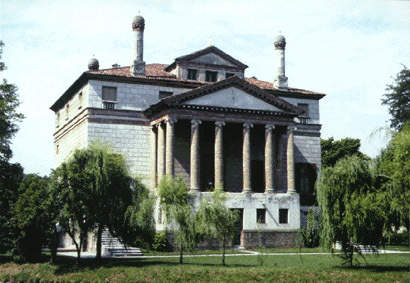 The magnificent Greek temple-front design of La Malcontenta rises high above the banks of the Brenta river near the coastal lagoon of Venice. The brothers Nicolo and Alvise Foscari commissioned La Malcontenta in the late 1550s, and it was nearly complete by the time of Nicolo's death in 1560. Interestingly, the villa's ownership was returned to the Foscari family in the present generation, and they have overseen a careful renovation. The source of the villa's traditional name is unsettled. Perhaps it was originally the name of the village where the villa is situated, or perhaps it describes the melancholy woman pictured in one of the frescos.